Situated on Rosebud foreshore in the heart of the Mornington Peninsula just 70km south of Melbourne Victoria. 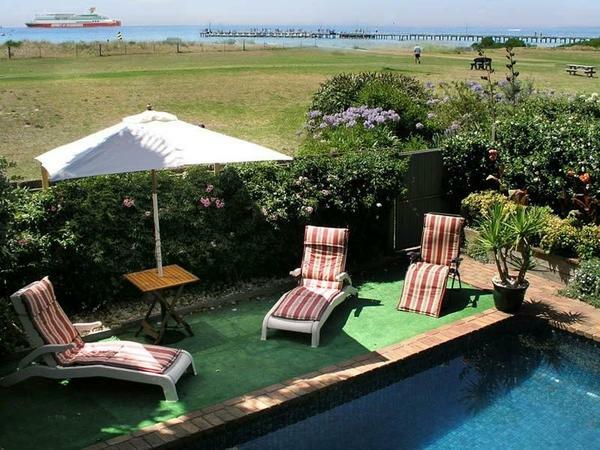 Watch the ships go by, lounge around your very own solar heated pool, stroll the beach, watch the sunset, fish off the pier or just relax and enjoy the many Mornington Peninsula's regional tourism attractions just a short drive away. is a fully self-contained ground floor two-bedroom apartment, set in magnificent tropical award winning gardens, making it suitable accommodation for couples or family groups. The apartment has a Central Rosebud location just a short walk to shops, cinemas, hotel, cafes and restaurants. The apartment has direct access to the safe swimming beach at Rosebud, Bay walking/cycling trail and Rosebud Pier. Only 2 apartments on the property. Resident Owner/Host lives in upstairs apartment. View further details re our Rosebud Beach Apartment accommodation including our Beach Apartment Availability Calendar. is a fully self-contained modern onsite caravan able to accommodate one or two guests set in lush garden surrounds with privacy screens. View further details regarding our Rosebud onsite Caravan accommodation together with our Caravan Availability calendar. Mid year and Senior Card Holder discount accommodation packages available June - September. Accommodation packages for Easter, holiday weekends, school holidays and special event accommodation packages available on application.